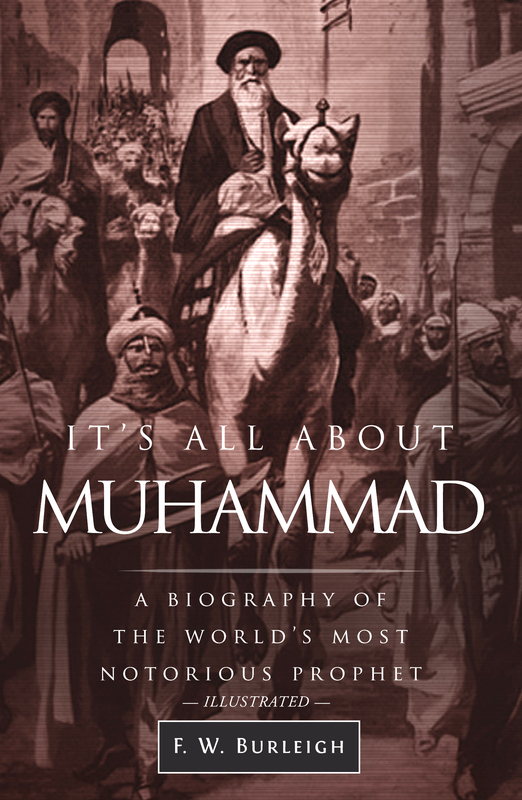 The illustrations below are the first 12 of 25 illustrations that appear in It’s All About Muhammad, A Biography of the World’s Most Notorious Prophet. If Islam’s “prophet” is notorious, it is because of his violence toward people who rejected him and his religion. His followers are notorious for hiding the truth about this, thus we publish these illustrations to show what they are hiding. 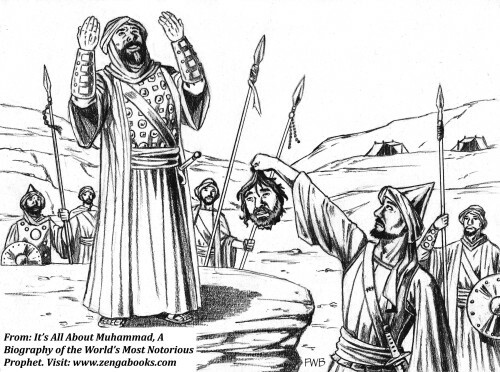 Half of the illustrations “depict” atrocities committed by Muhammad or on his orders. Learn more about the “religion of peace” by reading It’s All About Muhammad, a comprehensive and nonsense free biography of Muhammad based on the original sources. You can read Chapter 16, Murder, Inc., here, and learn more about the book here. 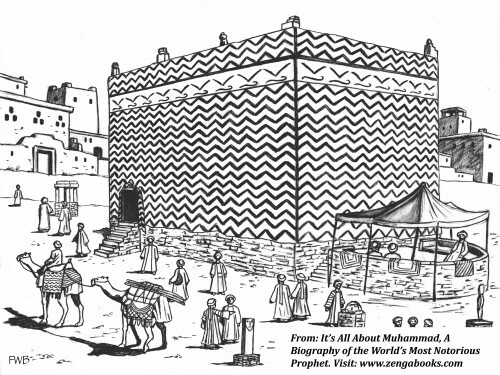 THE KABAH IS THE NAME used for the temple of Mecca. It means “Cube,” a nickname it acquired in A.D. 605 after it was rebuilt because of flood damage. Muhammad, who was at that time thirty-five years old, was part of the work crew. Prior to the reconstruction, the temple consisted of a one-story rectangular wall without a roof. The original temple, which was devoted to moon worship, began several centuries earlier as a low-wall enclosure of stacked rocks with the Black Stone meteorite inserted in one corner. MUHAMMAD IMAGINED sadistic tortures awaiting people in hell if they did not believe in him as Allah’s Messenger and obey him. His Koran is full of descriptions of horrific torture: people burning in lakes of fire; boiling water or molten metal poured down their throats; women suspended over fire with a hook through their tongues. His imagery worked its way into Christianity via Dante, who’s Inferno was inspired by Muhammad’s cruel imagination. 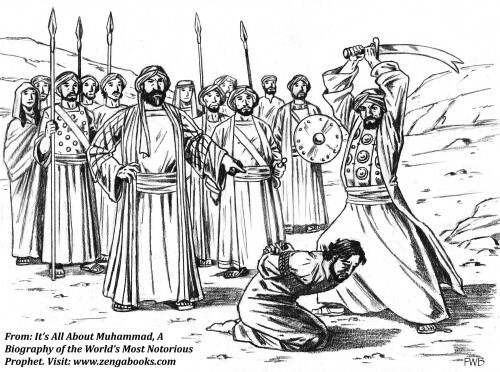 MUHAMMAD HUMILIATED. The Meccans despised Muhammad for his intolerance of their polytheistic beliefs, his demands they convert to his religion, and his threats of hellfire if they refused to accept his Koran as the word of God and him as the Messenger of God. 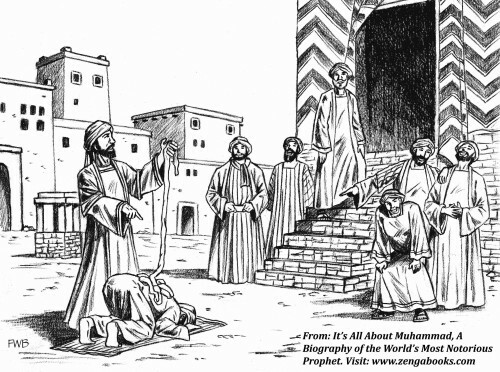 Here, one of the leading Meccan merchants drops camel entrails onto Muhammad’s back while he performs his prayer ritual, to the amusement of other Meccan merchants. CHASED OUT OF TAIF. Muhammad fled to neighboring Taif when it became unsafe for him in Mecca. He attempted to convert the people of Taif to his religion and convince them to take up his cause. The leaders at first listened politely to him, but when they understood he wanted to involve them in his conflict with the Meccans they ran him out of town. THE PLEDGE OF AQABA. 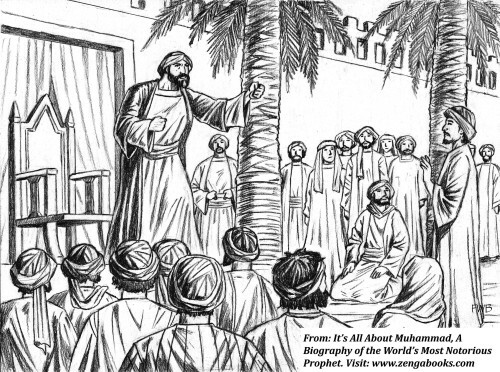 Muhammad obtained a promise of security from Yathrib (Medina) supporters. Six dozen people came to him in Mecca disguised as pilgrims, and they pledged to fight against “all and sundry” who opposed him. The pledge was essentially a declaration of war against mankind until all people adopted his religion and believed in him as God’s messenger. 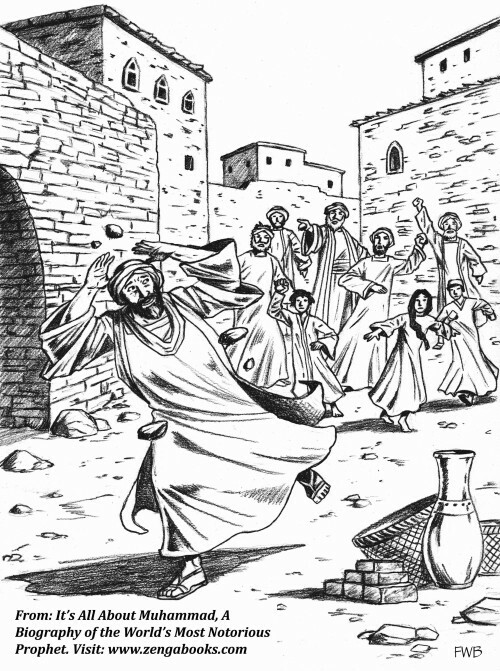 MUHAMMAD FLEES TO YATHRIB. 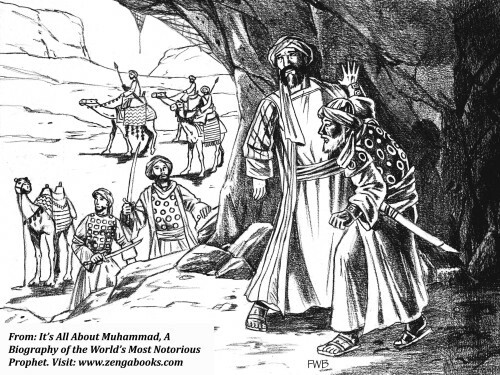 Concerned about Muhammad’s efforts to subvert their way of life, the Meccan leaders decided to kill him. He learned of their plot and escaped from Mecca in the company of Abu Bakr, his most trusted friend. They hid for three days in a cave and fled through the desert on camels, traveling at night to escape detection. After a journey of two weeks, they reached Yathrib, Muhammad’s home for the next ten years. 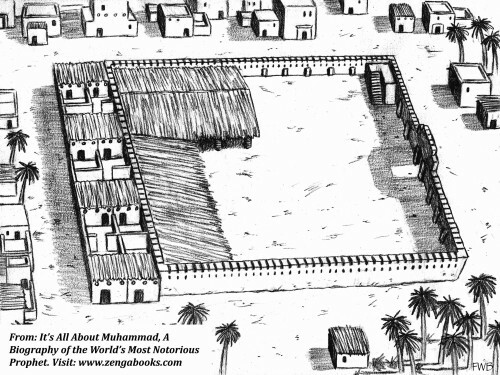 MUHAMMAD’S MOSQUE WAS HIS AL-QAEDA, meaning his base of operations. It was built after he arrived in Yathrib and served as a prayer area, residence, indoctrination center, and headquarters for the war he initiated first against his Meccan enemies and then against the Jews of Yathrib after they refused to accept him as their prophet. 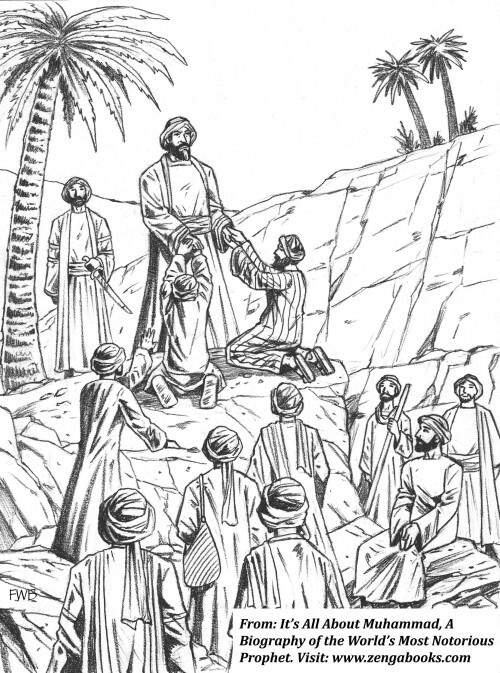 MUHAMMAD REJOICES WHEN THE HEAD of his chief Meccan adversary is brought to him. The Meccans had nicknamed him Abul Hakam, meaning Man of Wise Counsel, but Muhammad called him Abu Jahl, the Spawner of Madness. He was mortally wounded in a battle defending a Meccan caravan from an attack by Muhammad. 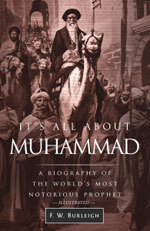 Muhammad sent one of his servants to find Abul Hakam’s body after it was reported he had been killed in the fighting. When the servant found him still alive, he cut off his head and brought it to Muhammad, who gave thanks to God for answering his prayers for the death of the Meccan leader. MUHAMMAD NEVER FORGOT INSULTS. 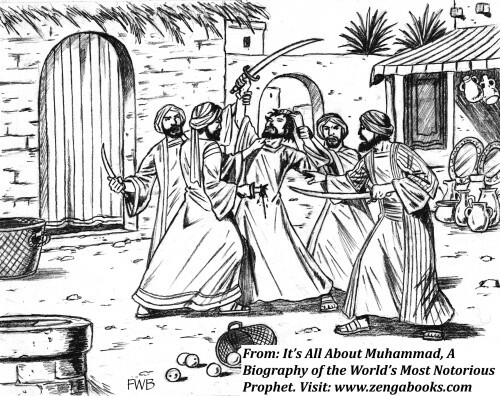 Here, Muhammad’s first cousin Ali beheads one of the Badr captives, Nader al-Harith, a man who had frequently mocked him in Mecca over his claims that God talked to him. 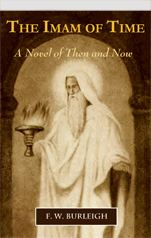 Nader used to follow him around and offer to recite Persian epic tales to the people he had addressed, telling them the Persian stories were more interesting than Muhammad’s prophet stories. 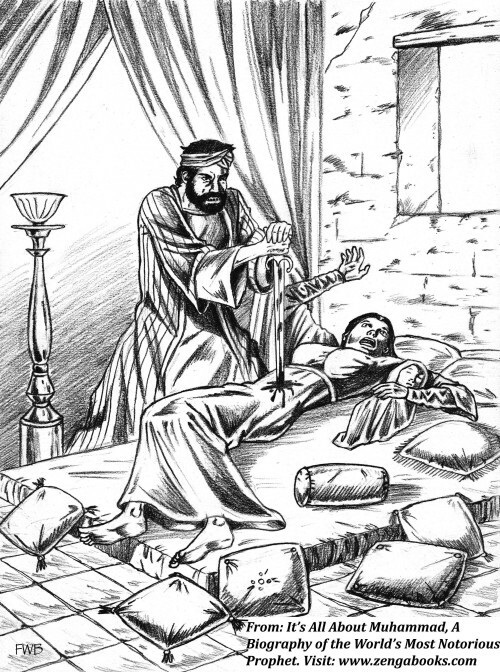 THE MURDER OF ASMA, the daughter of Marwan. Muhammad wanted her dead because of a poem she composed criticizing the tribes of Yathrib for failing to retaliate against him after he assassinated an elderly sheikh who had composed satirical verses about him. The assassin Muhammad recruited at the mosque broke into her home late at night and plunged his sword into her while she slept with her five children, including a newborn. Only the infant is depicted here. THE MURDER OF KAB ASHRAF. A wealthy Jewish perfume merchant, Ashraf was one of several poets Muhammad assassinated for composing poems critical of him. Ashraf lived in a fortified compound and had to be lured out. One of the killers Muhammad sent was Ashraf’s foster brother, Abu Naila. He was able to trick Ashraf into coming out of his compound with the pretext of borrowing money to buy food.